Harry Dorian is the managing partner of the Bensalem, PA law firm of Dorian, Goldstein, Wisniewski & Orchinik, P.C. For more than 30 years, he has focused his practice on negligence cases involving serious injuries or death, including medical and dental malpractice. He has represented both defendants and plaintiffs. Harry is continually named a “Pennsylvania Super Lawyer” by Philadelphia Magazine. For more than 15 consecutive years, he received the highest possible ratings for legal ability and ethical standards. If you are interested in bringing this course to your dental community, contact eva@evagrayzel.com. Oral Cancer is likely the most significant condition a dental care provider may ever see. Dental professionals need to obtain comprehensive histories and perform thorough head, neck and oral examinations. Oral cancer screening exams can detect cancer at an early stage, when treatment is most effective. Early treatment saves lives. Malpractice suits are stressful, disruptive, costly, and emotionally draining. Malpractice laws vary from state to state. Speak to an attorney in your jurisdiction about your particular situation. Dental malpractice cases for failure to diagnose oral cancer can result in very large verdicts because victims often require extensive surgery and treatment and cannot return to work due to facial disfigurement and an inability to articulate. The largest oral cancer case to date resulted in a $15 million recovery. What Are The ‘Standards of Care’? Legal definition (generally): “The degree of care that a reasonably prudent healthcare professional should exercise“. In other words, “Rules” that must be followed for the health and safety of the patient. The standards of care are based on many things, including research studies and surveys, training, common practices, and testimony from an expert in the field. The standards of care for early detection of oral cancer require routine oral cancer screenings for all patients. 2006: 54% of general dentists do an Oral Cancer Screening. 2009: 90% of general dentists do an Oral Cancer Screening on new patients. Literature and studies support the routine performance of oral cancer screenings. An expert will probably testify that the majority of general dentists perform oral cancer screening on their patients, and that the studies and literature require that practice, so it is the standard of care for dentist. Ultimately, a jury must decide if the standard was violated. A jury will be swayed by the low cost of a screening, the minimal time it takes, and the risk to the patient if oral cancer is not diagnosed early. Complying with the ‘standards of care’ means providing the best care possible for your patients, and possibly saving a patient’s life. Large potential damages: permanent injuries (e.g. disfigurement, inability to eat or speak normally, decreased prognosis). Significant delay in diagnosis: reduces the chances of survival or cure and affects the severity of surgery and treatment. In cases where delay was > 3 months, the patient won 60% of the time. In cases where delay was < 3 months, the patient won 14% of the time. Compliance: a ‘blameless client’ who maintains good dental hygiene, visits a dental practice regularly, follows instructions and recommendations, and promptly seeks treatment. Criticism: the patient’s (or a subsequent dentist’s) statements about what was done negligently. Breach of Duty: according to current practices, research, literature. Maintain good communication with patients: Studies show that a good dr/pt relationship reduces the risk of being sued. Stay current with research and studies: The standards of care are ‘fluid’; they keep changing..
“If in doubt, refer the patient out.” Stay within your comfort, training and skill level. Follow-up on recommendations and referrals with a phone call or send a correspondence and document it. 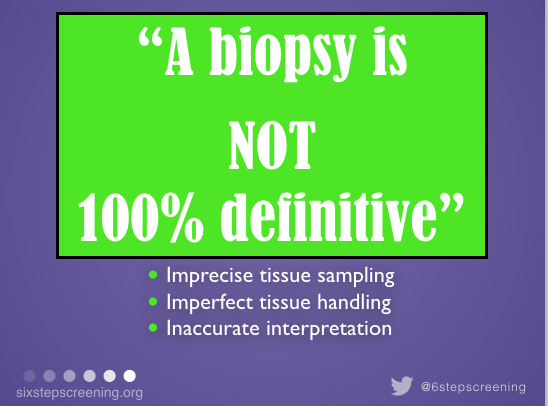 Don’t assume a negative biopsy is 100% accurate. Document, document, document: Chart all findings on examination (location, size, color, history), recommendation to patient, non-compliance by patient, broken appointments, lack of follow-up, referral names/dates, patient education. Include a perioprobe in the photograph of a suspicious lesion to document it’s exact size. Use ink, chart promptly, initial, use consistent and standard abbreviations, write legible entries. Document all intra-oral and extra-oral cancer screening exams. Alteration of Records can turn a “so-so case” into a good one and increases its value. Lawyers sometimes hire document experts who provide ink-dating along with a microscopic and chemical analysis. If a jury believes you re-wrote or changed records, they will believe you were covering up negligence. Mistake in chart: put a single line through the error, initial and date it. Addition to chart: properly date and time the additional information. Electronic Records have an “audit trail” and contain metadata showing dates of entries and changes. A computer forensic expert can uncover improper or altered entries. If you can save just ONE life in your entire career in dentistry, isn’t it worth it to do an oral cancer screening exam on all your patients? *Disclaimer: The information contained in this article and on this site is not, nor is it intended to be, legal or medical advice. Malpractice laws vary from state to state. Each case is unique. You should contact an attorney immediately for advice regarding your individual situation. There are time limits in all jurisdictions for bringing a claim, or for responding to a complaint, so do not delay in seeking legal counsel.